Research aim: The purpose of this paper is to investigate the internal (bank-specific) and external (macroeconomic and industry-specific) factors thataffect the revenue efficiency of banks. Design/Methodology/Approach: The paper considers all the Scheduled Commercial Banks operating in India over a period of 22 years from 1991-92 to 2012-13. Due to the non-availability of information for certain variables the sample varies across years. The revenue efficiency of banks is calculated by employing a non-parametric approach, namely, Data Envelopment Analysis (DEA). To determine the factors affecting revenue efficiency, the Panel Data Tobit model, as proposed by James Tobin (1958), is used. It is applied due to the censored nature of the dependent variable, i.e., the efficiency scores, which range from 0 to 1. Research finding: The results indicate that the Capital Adequacy Ratio (CAR), Net Non-Performing Assets to Net Advances (NPANA), Operating Expenses to Total Expenses (OETE), Business per Employee (BPE), Return on Assets (ROA), Size (LNTA), and Inflation (INF) reveal a negative relationship with the revenue efficiency scores. Equity to Total Assets (ETA), Total Loans and advances to Total Deposits (TATD), Total Investments to Total Assets (TITA), Total Expenses to Total Income (TETI), Spread to Total Assets (STA), Non-Interest Income to Total Income (NIITI), Cash Deposit Ratio (CDR), Time Dummy (TD), Public Dummy (PUBD), and Log of Gross Domestic Product (LNGDP) disclose a positive relationship for the revenue efficiency model. 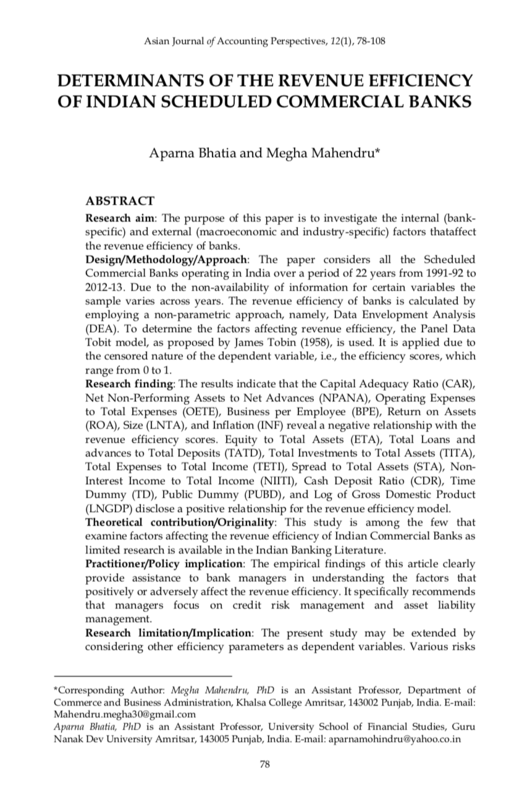 Theoretical contribution/Originality: This study is among the few that examine factors affecting the revenue efficiency of Indian Commercial Banks as limited research is available in the Indian Banking Literature. Practitioner/Policy implication: The empirical findings of this article clearly provide assistance to bank managers in understanding the factors that positively or adversely affect the revenue efficiency. It specifically recommends that managers focus on credit risk management and asset liability management. Research limitation/Implication: The present study may be extended by considering other efficiency parameters as dependent variables. Various risks faced by banks and off-balance sheet activities can also be taken into consideration. The impact of other events, such as global financial recession, might also be captured for future research. BHATIA, Aparna; MAHENDRU, Megha. Determinants of The Revenue Efficiency of Indian Scheduled Commercial Banks. Asian Journal of Accounting Perspectives, [S.l. ], v. 12, n. 1, p. 78-108, feb. 2019. ISSN 0128-0384. Available at: <https://ajap.um.edu.my/article/view/16889>. Date accessed: 20 apr. 2019.